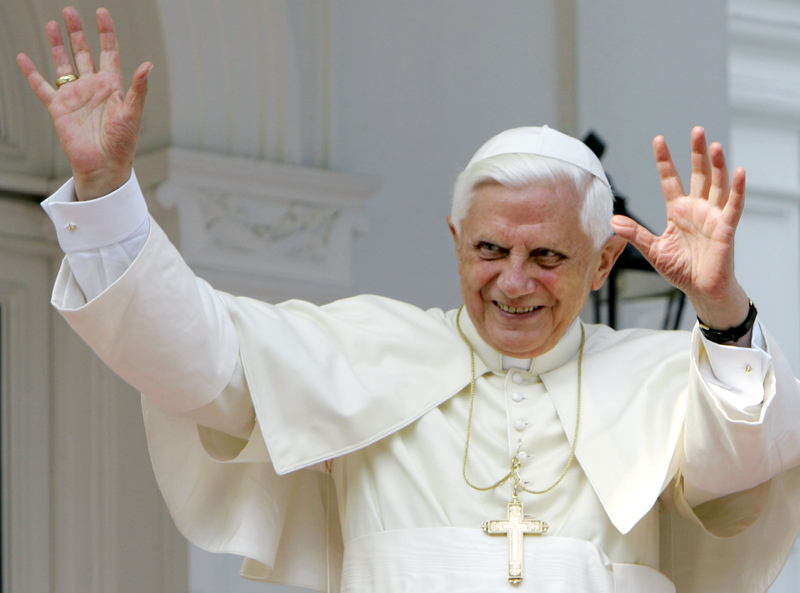 Longbows and Rosary Beads: We Love You, Papa Benedetto!!!! You have been a father to Catholics in every land; you have kept faith with tradition while still embracing the modern world; you traveled the globe and left a lasting legacy everywhere you went, including the United States and the United Kingdom; you have touched us all with your penetrating intelligence and gracious warmth; we, the Catholic Youth, would have followed you anywhere. You were our general in the field; our highest ranking official; the dearest member of our spiritual family. We are so sorry, deeply sorry, painfully sorry to see you go. But we know that you have grown old and the task has grown increasingly hard. What you do now, you do for the good of the Church. Know that we will never forget you, and that you will always have a special place in our hearts. Our prayers will always be lifted up for you. Remember us as your children, as we remember you as our father! But Cincinnatus – O happy Cincinnatus! A lovely tribute Pearl, I will miss him too. He is obviously very frail, but I hope he gets to relax a bit now and enjoy his time. It was only about 6 months ago when I saw him during the audience at the Vatican; who could have guessed such changes were in the pipeline?! Any tips or preferences for the new fella? All tributes to Papa B. are well-deserved. Mack really did a fine job summing him up as the epitome of selfless service. It really is amazing how swift and sudden all this shifting took place! God often works in mysterious ways. Let's see....another Italian pontiff is always welcome! After all, after perogies and preztels, pasta would be a nice alternative dish! LOL! Plus, another silver lining to the cloud is.....now you can unveil your "back-of-the-papal-head" photographs that you snapped during the UK visit and try to sell them for a pretty penny on ebay as his "riding off into the sunset" farwell pictures! Just paste some Swiss Guards over the pedestrians in plaid, and no one will know the difference! That's an amazing business plan! I always knew there was a reason I was holding onto those pics haha!